The Dog Tornado interactive toy is designed to stimulate and challenge your dog mentally. 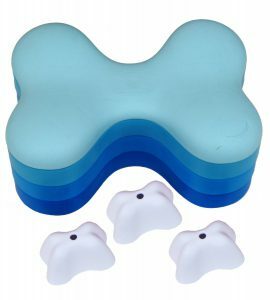 It is a four tier, bone shaped, swivel toy, with compartments for hiding treats. 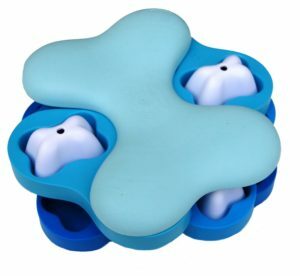 Also included in the box are three bone shaped compartment covers, which can be used to increase the level of difficulty. The object of the game is for your dog to figure out how to move the tiers, in order to reach the food. You create the level of difficulty by leaving the tiers open, partially open, or completely closed, and by adding compartment covers. The Dog Tornado is suitable for dogs of any size, age or ability. 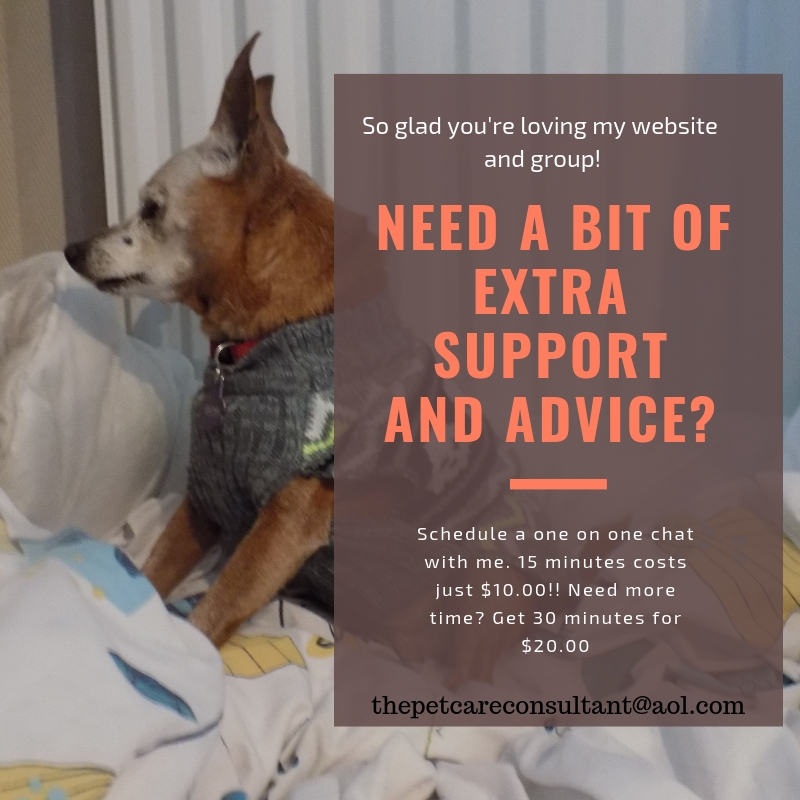 Also great for senior dogs, and those recuperating from surgery or injury. I add “surgery and illness” because if your dog is stuck in the house, with limited opportunities to go for a walk, he will likely start to feel frustrated. Mental stimulation, through interactive toys such as this one, will help release pent up energy. It is made of high quality heavy duty plastic, is dishwasher safe, and easy to clean. I’ve lived with my share of dogs who couldn’t walk very far, or were so abused they were too scared to go out. While I made sure they got physical exercise, it was important for me to provide mental stimulation as well. That’s why I bought the dog tornado. Some dogs took longer to figure it out then others, and there are ways to increase the challenge, but it isn’t a terribly difficult puzzle. That’s not necessarily a bad thing, because there’s a challenge and then there’s frustration!! Even if we just play with it for 5 or 10 minutes, it is a good outlet for unspent energy which helps with problem behaviours. It also allows for the creation of a deeper bond while we play together. Lately one of my dogs hasn’t been as interested in his food as he should be. To vary his meal routine I sometimes put part, or all, of his meal in the Dog Tornado. He looks forward to meal time now. When one of my dogs was recovering from surgery and couldn’t go out for a walk, I made sure we played with the dog tornado to help keep frustration at bay. There are four compartments in each tier that can be filled with treats, wet or dry food. You can even make doggie ice cream by mixing some canned food or sausages with water, pouring the mixture into the compartments and letting it set in the freezer. The level of difficulty is determined by you – make it easy by keeping the tiers open and the compartments visible, or increase the challenge by partially or fully closing the tiers, or using the compartment covers. The Dog Tornado is perfect for keeping your dog mentally challenged. It staves off boredom, helps improve behaviour, and aids in cognitive function in senior dogs. Any size, age, breed or level of fitness can use this interactive dog toy, although if you have a small breed tiny puppy, you may just need to keep the tiers open!! More than one dog can play with it at a time for extra fun. 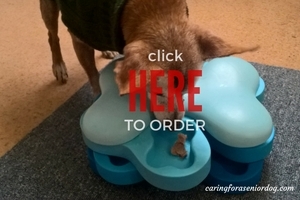 Great for senior dogs who aren’t able to get much physical exercise, dogs recovering from illness or surgery, or even during rough weather when the dogs can’t get out enough. Dogs who are less than cooperative at meal time, often become more interested when given their meal in the Dog Tornado. It makes it fun!! It’s also good for dogs who think they’re vacuum cleaners. Dividing the food amongst the compartments then closing all the tiers, means slower eating time. Stay with your dog, encourage him, bond with him. It’s preferable to end your session while he’s still interested, rather than when you have to because he walked away. It is constructed of high quality plastic that will take a lot of rough treatment from your dog. Easy to clean with water and dishwashing liquid or in the dishwasher. Rinse thoroughly. I must admit my younger dog finds the treats really quickly. I have to make it more challenging using the compartment covers. My research did reveal some negative experiences from people who purchased the Dog Tornado, which I will share with you. Dogs need physical exercise and mental stimulation, to be healthy and well adjusted companions. No it isn’t the most challenging toy out there, but not everything has to be difficult. It’s nice to have a mix of levels to vary the games you play with your dog. Although it looks like it may provide some mental stimulation for dogs, I am not convinced that it’s challenging enough. I agree with you that it is expensive for what it is. Hi Dinh, Thanks for your feedback. You can make it somewhat challenging, but I think people expect it to keep their dogs occupied for much longer than it does. As I was reading your article my first concern was about cleaning it – it looks a nightmare! Good that it is dishwasher proof but I think I would have liked it better if it came apart. We keep our labrador interested by hiding dog choccy drops around the room when she’s not looking – once she finds one she knows there are others to find and goes hunting! I like the idea of the Tornado but not sure it’s right for my dog. Thanks for the info – worth keeping in mind. Hi Jane, thanks for your comment. I must admit it’s not such a big deal to clean, I wash it in the sink and it doesn’t take too long. Sounds like your dog would figure it out pretty quickly, although putting the compartment covers on does make it more challenging. It doesn’t seem to be for every dog – you want a toy to keep them interested for a decent amount of time. I could put chicken in a Kong and it would take my dog a good few minutes to finish it. Sometimes I throw a few pieces of dry food around the kitchen floor for my senior blind dog to find. That keeps her busy more than a toy would. I may have missed this in your article but are the pros and cons relevant to a particular size of dog? For example would the toy be more challenging for smaller dogs than for larger dogs? Hi Andrew, thanks for the question, and it’s a great one! I don’t think the level of challenge is relevant to the size of the dog (although a tiny puppy may have more difficulty simply because of his size), as much as to the fact that some dogs will catch on quicker than others.